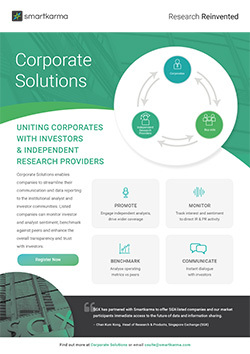 Monitor shareholder interest, promote research coverage, and streamline investor relations workflows from a single platform. Smartkarma and the SGX are currently running the Corporate Solutions Pilot Program for Singapore-listed Corporates, revolutionising the way listed companies interact with investors and independent research providers and institutional investors. Our Global Investor Relations Directory enables our Buy-side and Insight Provider audiences to reach Corporates. Investor Relations teams can update their contact details to ensure they are not missing out on investor inquiries.